When the RER/SmartTrack plan was proposed, it included four options for stations and service levels. This was before the Metrolinx Board in June 2016. Two options, notably one including a mix of local and express service, were dropped from consideration. At that time, the preferred option was a scheme that had a limited number of new stations within Toronto and service design with all trains stopping at all stations. The report explicitly notes that travel times for riders from outlying stations would rise because extra stops would make travel less attractive. The service options are detailed in the following table. Service levels on various corridors have been shown on the RER “How Will You Benefit” page based on that report for over a year. Here is the illustration for the Stouffville corridor. The footnote on Table 3 is quite clear: there would be 7 trains/hour on the corridor. However, at a public meeting at Scarborough City Hall on March 6, 2018, a Metrolinx rep claimed that service would be 11 trains/hour with 4 express trains and 7 local trains that would serve the SmartTrack stations. Metrolinx now proposes to operate a mix of express and local trains, but without added infrastructure, this will be challenging. The Stouffville corridor is now being expanded to double track, but without provision for trains to pass each other. This means that the most time an “express” can make up is the space between two local trains. If there are to be 7 local trains per hour, the space between them is limited by the signal system which is not designed for short headways. Confusion about the actual level of service to be operated affects claims for RER and SmartTrack at public meetings as well as the context in which ridership forecasts should be interpreted. Question 1a: What is the Service Plan for all corridors that was used for the demand modelling for the New Stations report? Question 1b: Is the Service Plan from 1a the actual service plan now proposed by Metrolinx for its operations, and if not, what is the replacement plan? Question 1c: What additional infrastructure will be required to operate the proposed Service Plan? Number of “boardings and alightings” for the AM peak and all day. Passengers attracted to the new station from adjacent stations. Access mode of passengers to and from the station such as parking, walking, feeder buses. Change in travel time for passengers due to the addition of a new station. Boardings and alightings are reported as a single number, and this is qualified only by noting cases where a station is more of a destination (more AM peak alightings) such as Liberty Village than an origin of trips (more AM peak boardings). Demand at adjacent stations, and in particular the change in demand caused by inserting a new station, is not shown beyond remarks that a new station may attract riders from other locations. The method of access by would-be riders to stations is affected by the assumed level of transit service and its catchment area, the quantity of onsite parking at a station, and the nearby land uses from which walk-in trips are feasible. A further problem relates to the service plan. If the demand model is not capacity constrained, it will assign trips to stations whether or not there will actually be capacity to serve them on trains. Question 2a: What is are the projected boardings and alightings, as separate numbers, for all stations in the corridors assessed in the New Stations report? For clarity, the purpose of this question is to establish the cumulative demand on trains over the corridor, not just at individual locations. Question 2b: What is the breakdown of trips arriving and leaving the stations by various modes such as parking, transit, walking, etc. Question 2c: What is the change in demand at adjacent stations caused by the insertion of new stations into a corridor? The Metrolinx demand model is very sensitive to projected travel times, and the effect of added stations on trips from outlying areas is routinely cited as a negative factor in the “benefit analysis” for a new stop. An offsetting factor cited by the RER project is that electrification will result in a noticeable cut in travel time. Indeed, this reduction has been used to show that new stations could be added without having a negative effect on ridership. Finally, there is the question of elasticity of demand. This is the relationship between a change in a variable such as travel time and the projected demand. For example, if a trip becomes x% longer, ridership would be projected to decline by y%. Question 3a: What are the travel times used to model demand on the corridors assessed in the New Stations report including the projected differences for express and local trains? Question 3b: What provision has been included in the model for the benefit of electrification on reducing travel times? Question 3c: Does the model use a linear relationship for demand elasticity versus travel time, or are there inflection points where the elasticity changes? If so, what are they? Question 3d: Does the model take into account wait time for service as part of the total travel time? Demand forecasts for GO/SmartTrack are very sensitive to fare levels. As promised by Mayor Tory, SmartTrack riders would enjoy “TTC” fares with full transfer privileges to and from the trains. Metrolinx and City staff are extremely evasive on this point because it is far from clear just what an “integrated” fare structure will be. However, for the purpose of modelling, specific tariffs would have been used to determine network behaviour under the current scheme and alternatives. At no point is the meaning of “no fare barriers” made clear, nor is there any discussion of different tariffs for GO/RER itself and for the overlay of SmartTrack services. This creates a situation where staff asked questions at a public meeting do not know what the tariff will actually look like, nor how the supposed demand at stations might be affected by underlying assumptions. At the March 6 meeting, answers about fare policies for SmartTrack ranged from “there will be free transfers to and from TTC” to “the matter is still being negotiated”. Question 4a: What are the tariffs that were used for the New Stations report demand modelling for the scheme described in section 3.6.1 of the report, and for the “no fare barriers” option? Question 4b: What exactly is the “no fare barrier” option? With respect to SmartTrack, there are several questions that will affect not just the demand modelling, but the acceptance of this service as an alternative to or part of TTC trips within Toronto. Question 5a: What pricing was used for SmartTrack services in the modelling? Question 5b: Will SmartTrack pricing be available at all stations where SmartTrack will stop, or only at the specific SmartTrack locations? For greater clarity, will SmartTrack fares be available at Milliken, Agincourt, Kennedy and Main Stations on the Stouffville service, and at Bloor and Weston stations on the Kitchener service? Question 5c: Will SmartTrack pricing be available on express trains stopping at stations within the City of Toronto? Question 5d: Will SmartTrack pricing be available on corridors other than Stouffville and Kitchener within Toronto? Many of these questions probably cannot be answered because negotiations are still underway to define just what SmartTrack is, and who will pay for various aspects of it including fare subsidies. However, the demand model must have used a specific tariff in order to factor fare levels into the projections. Question 6a: What are the demand model results (akin to question 2 above) for the “no fare barrier” option? Metrolinx has already published detailed Initial Business Case reports for each of the proposed new stations. These were not made public until after a Freedom of Information request by the Toronto Star. The information included in both the New Stations report and in presentation materials used at public meetings shows that there is more background information available as an update to the information in the original IBCs. However, there is no new set of revised Business Case reports, only the summary information in the New Stations report. Station designs have changed. The modifications are described in text in the New Stations report, and diagrams have been presented for all of the stations within Toronto at public meetings. Question 7a: Do updates for the IBC reports exist showing comparable information at the same level of detail, and if so, will they be published? Question 7b: Do design drawings for stations outside of Toronto comparable to those presented at recent public meetings exist, and if so, will they be published? Metrolinx purports to have assessed a number of new stations and produced “business cases” supporting their construction and operation. The level of detail in the New Stations report is considerably lower than in past studies. SmartTrack remains an ill-defined service in terms of frequency, stopping pattern and fares. The demand projections are given only for new stations, not for the balance of the network which, according to the report, would be affected by diversion of demand. Moreover, there is no examination of the capacity of the network, the proposed service plan and the demand that is cited for each of the stations. Costs projections for stations are not included in the new study, and are only bundled into two groups for SmartTrack and RER stations. Metrolinx claims that this is to avoid a situation where bidders would know what the station budgets are, and yet they expect the City of Toronto (and its taxpayers) to sign on to the cost of stations sight-unseen. Some individual station costs have been cited by the Star even though they are supposedly confidential. Despite the bundled pricing in the report, the underlying analyses were done knowing the actual cost estimates because these are cited as rising (mainly) or falling (a few) since the values in the IBCs. 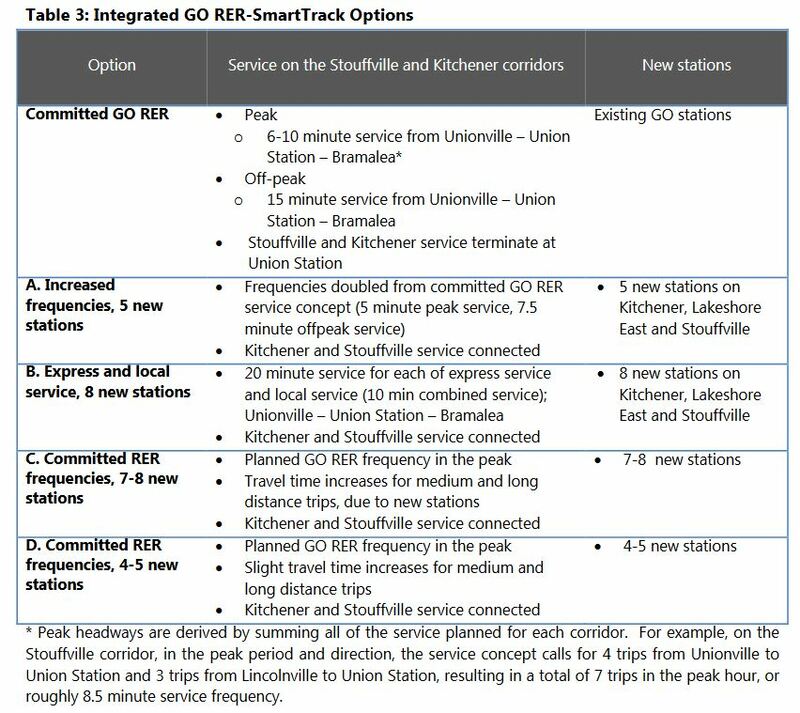 Many of the new stations would not stand on their own outside of a bundled proposal where a few key sites, notably East Harbour, supply the majority of the benefit to the GO network. All of the information sought by the questions in this article should exist because without it, the New Stations report could not have been produced. A worthwhile project for the Metrolinx Board would be to seek the publication of this information as soon as possible. This entry was posted in Commuter Rail, Electrification, Fares & Fare Collection, GO Transit, SmartTrack, Transit. Bookmark the permalink. Based on the experience of the SSE ridership estimates, where 14,500 in 2013 was revised to 7,400 in 2016, Metrolinx was asked to provide the assumptions and details how the Metrolinx station riderships were arrived at. Ridership is greatly affected by frequency. They were asked to supply frequency assumptions. At the public meeting, the whole audience asked for an answer, no response. Steve: Yes, I was there and was appalled by the evasiveness of the answers and sense that the people sent by Metrolinx knew only the basics, not the details that anyone with a sense of the politics of Scarborough transit would reasonably expect to come up in questions. Of course if the idea is to minimize the info the public actually gets, then sending someone who barely knows the portfolio is the way to go, but it insults the audience by wasting their time. The whole point of “let us get back to you” answers is to remove the controversy from the public forum and a supportive audience. I would ask, how much money would be saved by foregoing electrification, in the short run? Would it make more sense to run say 6 trains per hour (on 10 minutes peak) , to existing stations, and spend the electrification money on improving the tie to local transit. Would not the Sheppard LRT that actually was designed around this route, not provide a much larger service improvement to anyone in the Sheppard Corridor east of the line (and close to the west) to core, Would not running say 6 or 8 car trains not have adequate acceleration, without the extra stops with diesel locomotives? Would not the cost of electrification, provide the funding required to complete a decent portion of a network of BRT and LRT, that would then be more than paid for by reverting SSE to LRT, now that the ridership forecasts are being made more realistic? 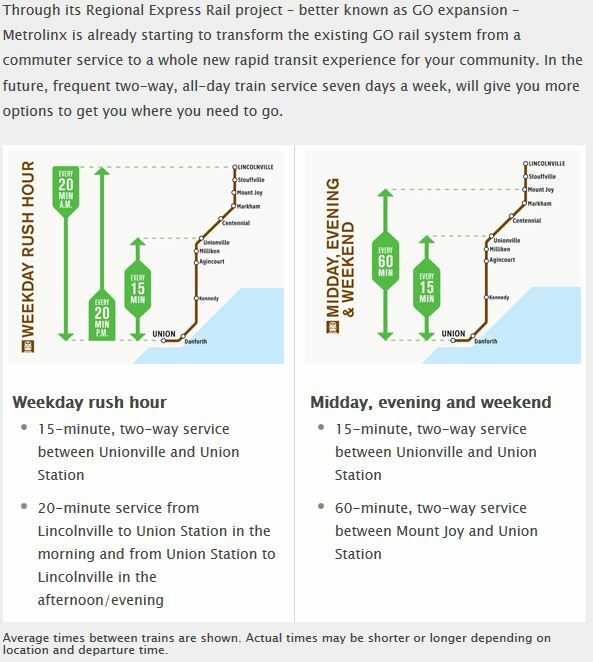 Would not a service design in Stouffville built around reasonably frequent service, but that was intended to serve say 5400-7200 riders per hour, not be fairly reasonable? Does that not imply a large expansion in daily ridership as it is? Would you not reasonably then reduce this to 15 minute service off peak, and still provide a high quality link to core? Would there not be a larger overall gain to service, and reduction in congestion, gained from serving more in Scarborough rides? Also in providing better transit to more of the away from core destinations? At a recent public meeting regarding the new station at St.Clair & Old Weston Rd. I asked one of the Metrolinx persons what the present ridership was for Weston Stn. He did not have a clue. Yet, in addition to that station and the other existing one at Bloor & Dundas they are planning not only St.Clair but also ANOTHER one at Eglinton West (Kodak). My 2nd question was “Who is going use all these stations?” His answer was that there was lots of hidden employment behind St.Clair & Old Weston Rd. plus the more visible plazas etc. Plus, connect to St.Clair Car. Yes, I am sure there will be thousands of people using that station (NOT!) and all the rest. Really??? Your question sounds as though an economist is asking a facetious rhetorical question, and yet I will answer it anyways. Put simply the answer is a definitive no. If the county sees fit to expand economic opportunities by signing free trade deals it is the municipality’s duty to help move people to those economic clusters that have the greatest competitive advantage. In the case of Toronto the business clusters that are most likely to succeed are downtown. Although I greatly respect the need for local transit, the priority should be building prosperity and equality of opportunity. I believe I remember reading that the York University stop on the Barrie Line was to be decommissioned now that the direct connection is available at Downsview Park (subway station). Steve: The current claim is that services to York U will be rejigged for the new school year in the fall. This is both for GO and YRT. I think this is also part of the wishful thinking about some sort of fare integration to sweeten the otherwise bitter pill. The current excessive focus does not best serve even the core bound trips, as it does not provide for the best total trip access. Failing to look at the real need to integrate with local transit to get too the route, means that by obsessing about only 1 part of the trip, you are failing the whole. Toronto is not only growing in the core, it has substantial growth beyond. Looking at the overall issues, it is clear that there is a need for lower cost office space in the outer area, in order to support that growth at the center, and the traffic generated by the existing destinations beyond core is enough to clog the access to the core bound routes. Hence becoming obsessed on the core bound, without looking at the total trip and the balance of all trips is ultimately self defeating. To get the most people access to core – in Scarborough, the Sheppard LRT would do far more to extend access than adding additional stations, or electrifying the line to support those stations. Strangely this would also serve to get more people to non-core destinations, hence free up road space, for those who actually do require auto – as part of their employment even in core. Contrary to your assertion, best service requires (1) looking at the entire trip, and (2) looking at the integrated nature of the economy. It cannot be a either or choice. A properly thought out Scarborough LRT that serves Kennedy station properly, while improving local service, does even more to enhance the trip to core. However strangely this is not considered in the core service obsession, because that obsession, ignores the integrated nature of trips. That is, the obsession, in not considering each leg – defeats your goal. The ideas that go into a downtown centric transit orientation are akin to macro prudential risk management in that they seek to mitigate aggregate social and economic systemic risk by channelling financial assets into those projects that are known to provide the highest economic potential and the greatest social access. I agree that a proper network is essential for allowing even a downtown centric transit system to function optimally. We must however recognize that we must prioritize our projects given the likelihood of increasing financial constraints within the short to medium term. A proper connection to the country’s most inherently robust economic region not only enhances good times, but it is a source of resilience and strength in bad times as well. Let us be clear, there is a difference between access, and good access. You must ask yourself, will a skilled professional happily use the service you are proposing day in and day out for their entire life? If not then my suggestion would be to redesign your proposal. Well you must consider getting to your GO station. If you do not live directly on the line directly beside a station, you are either driving and parking, or riding a bus in traffic. Since the idea is to increase access for all, and improve access, you must look at the tie to GO, and an LRT to GO is a much faster and more reliable ride than bus. If you look at the cost, much less than parking. If you consider the numbers that can reasonably walk onto the line, many more, and oh, if you look at service design that is deemed attractive in other cities, well, here also it does well. We must ask, largest improvement in service for the next dollar. Gradient separation is huge, double tracking is huge, additional stations are less clear, and the benefits of electrification, need to be considered in the context of whether the extra stations make sense, and what the competing use of funds is. Also get notable improvements in acceleration, using shorter trains and going to more frequent service, where you are for instance freeing up locomotives from other places where electrification is going to happen regardless-likely Lakeshore. So does the added costs of electrification, and added stations add more to the GO service impact than a huge improvement in transit access to the line? Malcolm N said: I would ask, how much money would be saved by foregoing electrification, in the short run? Malcolm N said: Would it make more sense to run say 6 trains per hour (on 10 minutes peak), to existing stations, and spend the electrification money on improving the tie to local transit. Wait you’re going with no electrification and 50% more service? The effect of electrification on system capacity is marginal (~2-5%), but you aren’t getting far by repurposing that money (say one LRT line, not a “decent portion of a network”). Electrification has always been a tool to appease adjacent neighbourhoods to accept increased rail service. You only get more trains so long as the electorate will support the government funding the expansion. Raymond said: Yet, in addition to that station and the other existing one at Bloor & Dundas they are planning not only St.Clair but also ANOTHER one at Eglinton West (Kodak). The Mount Dennis and St. Clair Stations have been in the works for years. They are conceived as nodal interchanges with a local service (all stops to Bramalea and express service to Bramalea and then on to Kitchener). The first came about with complaints about UP Express service. St. Clair Station grew out of community compensation for the West Toronto Diamond project. Drew said: I believe I remember reading that the York University stop on the Barrie Line was to be decommissioned now that the direct connection is available at Downsview Park (subway station). It is also a substandard platform and 1.8 miles from Downsview Park Station, so it had been slated for removal. However, there has been various debate about keeping it active. At this point in time, it’s in a grey limbo of neither shutting down nor getting upgraded. Drew said: Similarly, I remember reading that the existing Weston GO station at Lawrence was to be decommissioned to move it south to Eglinton to meet with the Crosstown. I never heard this one, but Weston Station has had several large improvement projects over the last decade, so I don’t see it happening. There has always been plans for a Mount Dennis GO Station with a UP Express station, which might allow the Weston UP Express Station to be demoed. Malcomn N said: However strangely this is not considered in the core service obsession, because that obsession, ignores the integrated nature of trips. I think the history and layout of the GO network forces it to be core-centric. I think GO should focus on moving people in and out of the core (by bus or rail) and the province invest heavily in local transit operations to “fill the grid”. Too much of the provincial money to local transit is focused on the big ticket capital projects rather than all the “quick wins” that are possible through buying and running more buses. Malcomn N said: …added stations add more to the GO service impact than a huge improvement in transit access to the line? I talked about electrification above, but with these new stations, there seems to finally be a twin focus on not providing tons of free parking plus seeking opportunities for mixed-use higher-density developments adjacent to the stations. Rather than trying to “solve the last mile” it’s probably better to just eliminate it. Except that say a single LRT line with that money would hugely extend the area served. It would create not only a large increase in terms of walking onto transit not in traffic, it would also increase the likelihood that a single car could serve a household. A short jaunt down from say Finch to Sheppard would put someone on the LRT line, and the other member of the household could drive on. The last bit, in terms of the electorate supporting it, while I agree, to me this is best achieved by creating the largest impact with the dollars available at each phase. The twin tracks and grade separation, are clearly required to get substantial benefit. Also you would note that if the GO line is going to take a decent number of the riders that were used to justify subway, then this money also could be spent extending and broadening the local network. LRT in the previous SRT line, could also be extended north, intercepting additional bus lines. Again, this to me creates a broader and more notable impact on the access to transit including GO. That is great, however it really only addresses access in the area immediately around the station. Improving integration, strikes me as spreading this opportunity a lot farther. Yes, and the reality of the lines they have makes it impossible for GO to not be core centric. I would also agree that the province is trying too hard to push the politics of the big solution. The idea of even helping to create light brt in a handful of spaces would have a massive impact. The decision to push subway has completely derailed real plans. The same money spent for subway extensions could be used to provide large amounts space for buses running with much less impact from congestion, and where a relatively small number of buses could have a large impact. While GO must be core centric, I think each dollar spent needs to look at the value it brings and the impact it makes on the region. Buses, inside and out of lighter versions of BRT, etc, seem to offer more opportunity to create real impact, and thereby deliver value, and build public support. Malcolm said: The last bit, in terms of the electorate supporting it, while I agree, to me this is best achieved by creating the largest impact with the dollars available at each phase. The engineer in me completely agrees that pure efficiency is the best policy. The cynic in me has come to see some grease is needed to move the wheels of progress, and if that grease can at least take the form of a marginally productive project, take the win and walk away. I think this heavily depends on the electoral mood. I suspect we are coming back into a time where the demand to show me what we got is rising again. The sense that big bang needs to come from small bucks would be very likely the mood emerging shortly. This will push buses in front of BRT and BRT in front of LRT and make subway, even where truly required harder to sell. I suspect we will be back in a period of show me that it pays now. Sadly this will make the DRL harder to sell, as it is I suspect the one subway project that really would pay – although I struggle with it beyond Eglinton. However, I hope it will mean actually getting done, what really is needed now, and getting away from the borough based identity politics. East Bayfront would pay, and should be built now. Any good project design begins with a keen understanding of the client and the situation. If you impose your own personal biases for a preferred theoretical outcome on the situation you will always be disappointed and thus become cynical, because the client has a vested interest to reject your proposal. This depends on whether or not the underlying issues that caused the problem have been resolved. Have the deep socio-political cleavages been resolved? Has the region in question been made economically resilient so that it is able to withstand an exogenous macroeconomic shock? Has the substantial un-priced systemic risk affecting the area been mitigated? If your answer is yes for all of these questions then you will get your wish, otherwise there will be some work that needs to be done. I suspect the Ford-led PCs will be more populist than frugal. I suspect the Liberals would follow their same course and the NDP aren’t ready to “out bid” the Liberals for votes. The question then becomes, who is the client? Transit users (or potential transit users)? Tax payers? The voting public? Or government officials seeking feathers in their caps and votes in their pockets? Metrolinx and the TTC are political pawns that have a thumb on the scales to give whatever outcome is favoured by the flavour of the year leader. Given the province’s debt level it will likely be the bond market. The only way to justify funding is to show that the project has a strong net present value, which GO RER/Smartrack does well. Steve: Since we have no idea what the operating cost of SmartTrack will be, nor the level of subsidy someone will have to pay to enable free transfers to and from the TTC, it is impossible to state what the NPV of the project is. So far all we have is Metrolinx hocus-pocus accounting. Your statement is, to put it kindly, naive. Less kindly, complete hogwash. You are making the flawed assumption that there will be no funding constraints moving forward. The province is now facing substantially increased exogenous competitive pressure, with an economy overly dependent on rent seeking activities with a heavily indebted consumer in a global environment where the discount rates are normalizing. It does not matter which government comes in, they will all be faced with the same daunting challenge, and reality will keep them in check. Steve: Reality does not seem to be keeping any of the spendthrift “conservative” governments in check at all. They will spend like drunken sailors if the have to. I would ask, will the next government look seriously at the debt issue, or will they wait for the markets to react. Also I would suggest that carefully considered spending would actually increase the ability to pay. It is in this light that investments should be made. It is also in this light that we need to start using the word investment and demanding that it be used. Investment should only be used as something that either increases income, or decreases expense. If it does neither – it needs to be viewed as an expense. I would suggest, that East Bayfront – represents an investment, in these terms – from both a city and provincial perspective. I would suspect that this would also be true of say Scarborough LRT and Sheppard LRT and Finch West LRT. They would generate, over time, enough impact to actually pay for themselves through better use of buses and increased ridership, relocating investment to reduce road requirements, increase land value, and increase income generated, while reducing the cost of income transfer programs are, enough to actually pay for themselves. That is changes to the costs and revenues of government. This is a lens that can be sold, but only if we stop, with the painful distortion of business cases often presented. There is a real need to start looking at projects through this lens, because this is the hurdle that will need to be made, in a world of rising interest rates, and a sudden realization of the limits of government borrowing. Steve: There are few transit “investments” that “pay for themselves” without a lot of economic hocus pocus. In particular, the spending (capital and operating) might come from one entity (the government) but the benefits accrue to others and not fully recovered through taxes. Indeed, if we told, for example, Oxford Properties, that we were going to raise the value of their shopping mall to recover the cost of building them a subway line, they would probably quickly abandon expansion plans. Metrolinx has spent years trying to justify various transit projects based on a dubious economic model, and of failing to fully evaluate alternative strategies for their cost effectiveness. The Minister says “build me a subway” and it is then Metrolinx job to cook the books to make this look like a worthwhile project. For me, the process has become so corrupted that I assume any numbers I see are creative writing and little more. PS. However, Ford is a populist, not a fiscal conservative – remind yourself – “Subway, subway, subway” is not the battle cry of a fiscal conservative. It is the battle cry of those who have found out what the low information voters want. Steve: I would argue that it is not necessarily what the voters “want” but what, through disinformation and blatantly divisive arguments, they have been convinced is the only “acceptable” alternative. That is the issue. It is possible to make a cogent case, in terms of all levels of government, and the impact on other programs, and transit delivery, for transit to be really an investment, that will pay net to government through displacing road construction, attracting investment etc. However the process has become so grossly distorted, that we do not start with the city planning perspective, or the transit perspective, but instead the political one, and no analysis seems to survive it starting there.